It can be hard to write a product review of a freezer in the middle of winter. The last thing you want to think about is keeping things cold. Fortunately, our editorial offices are in Beverly Hills, California where we’ve been blessed with 70 degree weather since December. So it might be winter, but ice cream is still on the menu. We’ve been fortunate to have the new Frigidaire freezer model GLFH21F8H in house for testing for the past couple of months. The freezer we tested is a clean white upright model with just under 21 cubic feet of interior space. It is wrapped in a simple white enameled, textured steel with a sleek, low profile handle. The freezer sports a digital display with a control panel on the door front. In these days of cheap slapdash construction and assembly, it’s nice to see a product with solid fit and finish. It has no rough edges, nice square joins at the corners, a door that hangs well and moves smoothly on its hinges. The workmanship hints at decent quality control in manufacturing. While you could certainly put it in your garage, it would look fine in your kitchen. 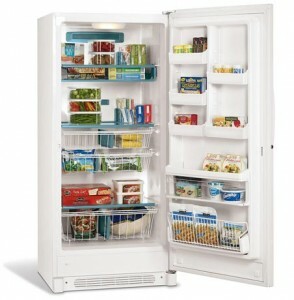 Inside the freezer, you have clear visibility and access to the stored contents. The interior is well lit, with clear glass shelves that neither frost nor fog up. The storage system includes two fixed height, full size glass shelves and one adjustable glass shelf. 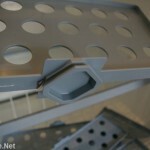 You also get three full size pull out baskets and low profile slideout “Pizza Shelf” hanging beneath the top glass shelf. The storage system gives you a lot of variety for flexible storage. The pizza shelf is a great little addition. We generally use the top couple of inches in any shelf space to slide in pizzas, pies etc. and let them perch precariously on the tops of whatever is sitting on the shelf. In the Frigidaire Gallery Freezer, they’ve grabbed that extra air space and hung a nice flat slideout bonus shelf. One of our favorite touches with the Frigidaire Gallery Freezer is the collection of movable spacers. These small vertical plastic dividers snap onto the back of the glass shelves and provide support and defined space. They allow neat stacking, and in our test freezer serve to keep bags of frozen fruit and vegetables from toppling onto each other. The flexible space control is carried over into the wire bins as well. 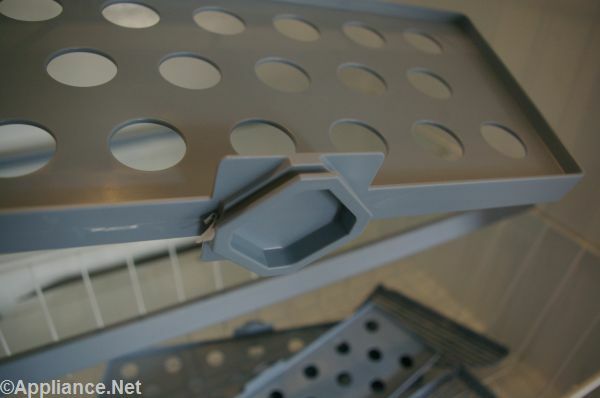 Each bin comes with a twist in adjustable internal divider. Anchored by the drawer’s wire framing it can stand up to the pressure of a full load in a packed drawer. The freezer door has five adjustable height bins in two columns on the top half of the door. Each bin is about 10 inches wide by 5 inches deep and can easily hold two half gallons of Ice Cream (French Vanilla or Fudge Tracks are highly recommended by this editor.) The bottom of the door is a full width wire bin that rocks out. We’ve been using it to store 5 pound bags of flour we’ll be using in an upcoming review of mixers and bread machines. The middle of the door has a second full length bin, and one of the Gallery’s signature features: a distinct full width closed shelf set aside as a soft freeze zone – ideal for ice cream. Our only complaint is that its scaled for pints, and when we want ice cream we can polish it off in half gallon doses. While we found the storage system of the Frigidaire to be well conceived and implemented, one issue to keep in mind is that space efficiency is lost when you replace shelves with drawers. Each drawer needs clearance on all sides to allow easy motion, and that margin space is effectively removed from use as storage. In the case of the bottom drawer, the seven inch clearance just isn’t enough to make a satisfactory bread drawer, and we had less effective capacity than in another 20 cubic foot freezer. 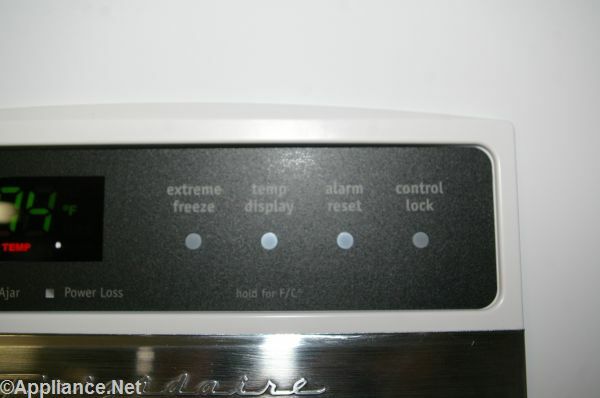 An interesting feature set of the Frigidaire Gallery Freezer (GLFH21F8H) as tested, is the digital display panel on the door front. The display gives a digital readout of the current temperature and allows you to exactly set how you want the freezer to cool. The feature we found most impressive though were the alarms and warnings available on the front panel. On one rainy day, when we lost power repeatedly at our offices, I wasn’t particularly surprised when I checked the freezer to see the lost power indicator verifying that the freezer had lost power at least once that day. I was pleased to see that the high temperature indicator made it clear that the freezer never warmed up to a range that might cause the food to spoil. If the freezer had warmed during a lengthy outage, I would have been warned by the display that I had an issue. Living in a family of forgetful, and slightly negligent kids and dads, the idea of an alarm that will alert you when the door is left open also appeals to me. As part of our test, we also made it a point to call anonymously into Frigidaire’s consumer support hotline. We found their tech support team knowledgable, friendly, helpful and generous. They were quick to respond and quick to offer solutions to whatever we asked about. 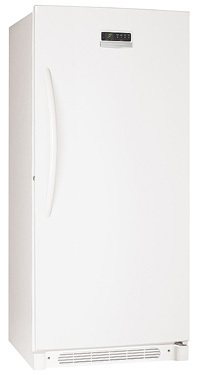 Overall, we’ve found the Frigidaire Gallery Freezer to be a solid, well conceived appliance and would be pleased to recommend it to our readers.